It took two trips to Aruba to discover Baby Beach. We overheard American Airlines flight attendants talking about their favorite snorkeling places and Baby Beach, Aruba, was at the top of the list. Actually, the snorkeling is outside the protected beach area and it’s totally safe – you’ll see plenty of people out there throughout the day. As many of the popular beaches in the world, Baby Beach has evolved as far as facilities and access. You can still come here for free – with your rental car, figure out where the oil refinery is at and just come down past it bearing the roads toward the ocean. If you get lost, simply ask (men!) and the locals will be more than happy to assist. A few shade huts have been installed over the last few years and a shed that holds a snack bar now graces the areas toward the parking lot. The dark areas in the water to the upper left, in the shallows is sea grass. It’s a little creepy if you’re not used to it. Most people walk around it. If you see any fish when snorkeling in this shallow area, they will most likely be in the grass. The real fun snorkeling here is through that channel in the artificial reef in the upper center of the picture. Fish thrive in that are and even though you see a little silt on the day this photo was taken, it is generally very clear and note the dark water further out – the bottom goes down quickly and you find yourself over giant elk horn coral with schools of blue tang. It’s amazing! This is a recommended beach and a must see if you spend more than a day in Aruba. It is at the opposite side of the island than the cruise ships, so it doesn’t work to drop into Aruba and plan a trip to Baby Beach – unless you’re spending the day. What would a Aruba vacation be without a visit to Baby Beach? And dare you venture out of the wonderful cove to see the ancient elk horn coral that is home to thousands of beautiful tropical Caribbean fish? I’m sure you want to know what is so special about this beautiful cove next to the Coastal Oil Refinery on Aruba’s southern most tip. For a few, this view is the greatest thing on the island. It means peace and quiet and no waves or wind. Brilliant white sand with a touch of that Aruba dry air. Almost perfect, no? When oil became king back in the 30’s, workers and their families wanted a nice place to relax close to their homes. These folks weren’t on vacation, but they’ve built something that has lasted for vacationers worldwide. Baby Beach sits right off of the small Lago Community which was created by the workers of the then “Lago Oil Refinery“. Lago, named after Lake Maracaibo, Venezuela, refined oil from that country. Last we heard the refinery was still in operation and you will probably see some tell-tale sign of smoke or other activity while you enjoy Baby Beach. In any case, don’t worry that the smoke will head your way. There’s a reason why the refinery was built of this side of the island. Remember those trade winds! Yes – the smoke blows towards South America. The Baby Beach cove was partially closed using concrete and rocks to form a quiet beach area. What happened over the years is the cove filled with sand and made it ideal for families to wade and enjoy a great weekend. And note this tip; Baby Beach is “the” beach for the locals. They are here all weekend and can show you the best spots along the shore. They’ll tell you that right outside the cove are some of the nicest coral formations on the island – within snorkeling distance. So on your Aruba vacation you can sunbathe and snorkel here! Baby Beach is far away from the high rise hotels and resorts so you will need to pack a few things before you decide to make it a day here. Plan to take snacks and water. There’s now a great snack shack at Baby Beach; we’re sure full facilities will follow. In addition to food, take snorkel gear and beach towels. And, please note, there are now public facilities nearby. If you’re adventurous, visit the reef right outside and to the left (as you face the ocean), of the barrier wall. The coral was damaged by Hurricane Ivan in September, 2004. You will see some new growth or areas where the coral survived. Take an underwater camera. There are many disposables that work underwater – bring them from home as they are cheaper than buying them on the island. Keep them out of the hot sun. Have fun! Notes – something for everyone, can be crowded on weekends as locals love this gem! Baby Beach is blighted by being right next door to as dirty old refinery. Made me sick to look at it. as you might say, but the ability to travel and enjoy the beauty. You denigrate the refinery but it is like God’s world. Good and bad, not needed but necessary. It is for us to see and judge. If the oil is nowhere, would you have parasailed from Chicago? or perhaps a solar panel stuck to your Yugo? Ah, a wind turbine tied to your Segway perhaps? The refinery is ugly and all but from baby beach it’s very far away. I just forget it’s there. Baby beach is my favorite beach of all I’ve visited. USA, Puerto Rico, and Chile. It’s because it is public but clean and the few people who go there are nice. The water is perfect temperature. Not freezing like the Pacific or the American Atlantic nor hot like Puerto Rico.. I hated that water. I just love it. I have visited all the beaches in Aruba and I won’t change my beloved Baby Beach jejeje. I recommend going trekking to the left of beach, nice sights there but not for swimming. It is the wild side but if you like to walk, GO! we were told over and over to see Baby Beach. Well, we did…and i was very disappointed. perhaps we became accustomed to the super groomed beaches near the resorts, but Baby beach just seemed…I hate to say dirty … so…i’ll say not so clean to us. refinery right there left an awful lot to be desired. really not worth the trip…but see for yourself. Not for me. TO ANONYMOUS 8-01-08: YOU CAN HELP SAVE THE NEED FOR REFINERIES BY STAYING HOME AND NOT BURN ALL THAT OIL FOR YOUR PLANE RIDE OR CRUISE SHIP. GET A LIFE. I feel so sorry for the people who go to Baby Beach and only see the refinery in the distance. What a shame because they miss the beautiful natural beach and the calm, clear water not to mention the thousands of colorful fish that make their home here. BB now has restrooms, two snack bars, lounges and cabanas to rent and non of the crowds of Palm Beach and others near the hotels. Beware! It’s for those looking for a more natural experience! If you are happier with sand that is raked twice a day, stay away! For those who are adventerous enough to let themselves enjoy it, BB is one of the BEST! I just went last week and I wouldn’t go if you don’t have snorkeling equipment. I’ve causually snorkeled before, but I don’t think ever been so amazed and stunned in my whole life as I was when we swam to the to the mouth of the bay. What a fantastic, beautiful and amazing adventure! Baby beach is a beautiful beach, the water is crystal blue, and shallow which makes it great for younger children. Great place to snorkel!!! 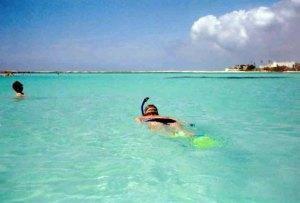 I have been actively diving for 32 years and going to Aruba for 12. If you brave swimming past the coral at the mouth of baby beach in the shallow water, you will be rewarded by some of the the best snorkeling I have ever experinced. It will gradually deepen and you will have almost unlimited visabilty (probably because of the way the water runs around the corner of the island). Beautiful coral and all just 100 to 150 feet from the shore. The formal dive sites in Aruba are so/so in my expereince but the snorkeling past baby beach is truly exeptional. I absolutely agree with you. In fact the mammoth elkhorn and other corals are so big that it is actually kinda spooky if you’re out there alone. Magnificent as well to see a nice school of tangs drift by. Make sure to save those left over french fries or any scraps from your lunch/dinner. Give it to the fishes in BB!!! They literally eat it out of your hands. My kids had a blasted giving food to the fishes. We visited Baby Beach during a cruise trip in 2004 it was by far the best beach we found in the Caribbean , absolutely perfect for kids. Never mind the refinery it provides a mysterious eerie backdrop to a naturally stunning & beautiful place. Fair to say not a lot there just a bar sand sea & peace, but who would want more. If you’re cruising don’t worry about getting there & getting back as its on the other side of the Island to the port. Our driver took us & waited all day until we were ready to return first class service you come to expect from the islanders, probably some of the nicest people in the world. I'm glad to hear there is great snorkeling as I will be there soon. I do, however, worry about those who bring food for the fish. Yes, it attracts them, but I was told in Maui it's not a good thing to do. Let nature be and just enjoy the way everything looks without interfering. Just my two cents. Thanks for all you precious rewiews. I'll drive there today as I'm eager to see myself this pearl. I will keep the thread updated and I will post some pictures of how the beach looks today. Obviously, I willn't feed the fish! My family and I lived on Aruba for eight years because my husband worked at the refinery. How fortunate we were to live in The Colony and have Baby Beach right down the street from us. What a truly beautiful beach to be able to go to whenever we wanted and after a while you forget the refinery is there. You can’t dwell on one negative thing when there are so many positive things about Baby Beach and Aruba in general. We moved home to the states several years ago, and I miss living on Aruba every day! 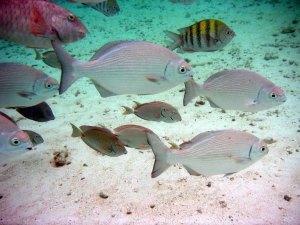 Even without snorkel equipment – we could see the beautiful, colorful fish near the opening in the cove. It is quite shallow there, you can stand. Baby Beach is wonderful! The calm (always calm, shallow water. It is deep enough to swim, some spots over my head. To me it is paradise, feels natural.